The oh-so-lovely members of aptly named girl group Lovelyz will be coming to town this Sunday. We will be getting to know more about the girls this time to get Lovelinus all hyped up for the upcoming concert in Singapore! Which part of you can be considered as cute? Ji Ae: I’m not cute! I’m charismatic! Soojung: When I’m doing something I like. Question to Mijoo: You’re a music bank queen with your funny and bold poses. Any advice on how we can be as confident as you? Mijoo: When I love my confidence, anything is possible! It has been quite some time since you guys debuted, are there any other areas you’d like to venture into besides singing? Baby Soul: I want to try acting and variety! Ji Ae: I like speaking just like a music show MC or radio DJ, so when I see things like that, I really want to try it! Jisoo: I want to try everything, so I want to start off with being a YouTuber. I think I will be able to showcase many different sides of myself, hehe. Kei: Musical! It’s my second dream! Jin: Writing songs and composing. Yein: I want to try acting and being a radio DJ! There are no four seasons in Singapore but you guys are bringing your ‘winter’ concert to Singapore. Is there anything special we can expect from you all? Baby Soul: Although Singapore is always warm, if you come for Lovelyz’ concert, we will be able to experience a warm winter together. Jisoo: Songs that we were not able to showcase as our Korean concert, as well as the warm and refreshing winter that was showcased at our Korean concert… You will be able to have the feeling of “This is Winter!”. Mijoo: It’s a secret hehe. Kei: I’m confident that we will be able to deliver a touching and fun time! Jin: Spoiler… Trust in what the other members have said but for me, it’s a secret!! Hehe. Do any of you have plans on releasing an album soon or in the future? If so, what kind of concept would you like to go for? Baby Soul: We plan to have various consistent album promotion this year; I really want to try a girl crush concept with a powerful choreography! I want to show a cool side of us. Ji Ae: I want to be able to meet everyone faster with better songs which you can only feel Lovelyz’ vibe. Jisoo: We will return soon with a new album as a mature and lovely Lovelyz. Mijoo: Girl crush concept! I want to try something different from the current Lovelyz. Kei: Given the chance, I want to be able to meet the fans again quickly~ I want to try something with more energy and a girl crush-like concept! Jin: I want to try a ballad concept. Among our seniors are those like BTOB who also have dance tracks, but had also tried a ballad concept during their promotion. Soojung: We will meet Lovelinus a lot this year! I want to be able to do songs of various genres! Yein: We will also release an album this year that’s full of songs with Lovelyz’ vibe. The concept I want to try is a Girl. Crush. Concept. What is the one item that you’d bring with you to a deserted island and why? Baby Soul: Handphone? With a phone, I can read, watch movies, sing, contact others, and find information! Ji Ae: A box of ramen – I am going to find firewood to cook ramen. If I want to survive I have to eat! Jisoo: Cooking oil and a good boat. When I reach, I will go home. Mijoo: Handphone~ A handphone’s use is limitless. Jin: Soojung (not just any object, but Ryu Soojung!). Because she’s smart. Soojung: Fire – I think a lighter is necessary so that I don’t starve or feel cold. Yein: Fire – with fire you won’t feel cold and you can even cook, and you can call for S.O.S through the smoke. Baby Soul: I want to try working with hip-hop or R&B artists. It’s one of my favourite fields and there are lots of amazing singers, so I want to try a feature or a collaboration. Jisoo: Adoy – I feel that Lovely’z songs are pure and have a cool feeling to it, so working with Adoy would be a new feeling and experience. Kei: BoA sunbaenim, it’s my dream! Soojung: Ph-1 – I want to collaborate with a rapper and because I like Ph-1’s rap style, I want to try a collaboration with him. Yein: I want to try a collaboration with the band HYUKOH! Do you have any wishes that you’d like to fulfill by the end of the year? Baby Soul: For Lovelyz to go big!!!! Mijoo: I want to be able to meet more fans. Soojung: For Lovelinus to be healthy! Yein: For Lovelyz and Lovelinus to not get sick and for us to be together forever!! And also to appear on New Journey To The West!!!! What is a song that you’ve been listening to these days? Baby Soul: Because I’m always on random play mode I don’t have a specific song I’m listening to! I’m always looking for different and new kinds of song to listen to hehe. Ji Ae: I often listen to Lovelyz’ debut album songs. Kei: My mood feels good listening to Baek Yerin’s <Across The Universe>, it’s a song that marks the beginning of my day. Jin: God’s <Road> (song by IU, Henry, Jo Hyunah, Yang Dail). Soojung: All songs by Sam Kim! Yein: Paris in the rain by Lauv. Which member would you want to swap bodies with for a day? Baby Soul: I don’t want to switch bodies hehe. I want to just live as myself. Ji Ae: Soojung – I want to just live a day as Soojung with her height, body, voice, personality, and heart. She’s so pretty. Jisoo: Yein – I want to try living with a gorgeous body. Mijoo: I think I don’t want to switch~ I like myself. Kei: Soojung – because she’s really lovely. Jin: Jisoo unnie! Because I like eyes without double eyelids hehe. Soojung: Baby Soul – I want to try having neat and cute power vocals! Yein: Kei unnie – I want to be Kei unnie because I want to try living with a soft body haha! Did you have fun reading about Jin’s everlasting love for IU and how the majority of the girls are hoping that they will be able to make a comeback with a girl crush concept? We all hope that their wishes will come true! 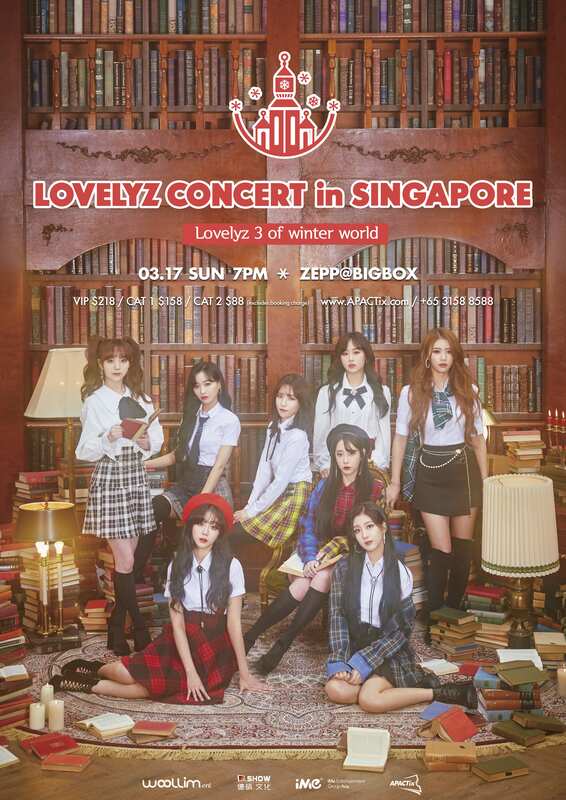 On that note, Lovelyz will be making your dream come true this weekend with during their concert, “Lovelyz 3 of Winter World 2019” in Singapore. Lovelyz will be coming down to grace Singapore with their lovely presence this Saturday. Have you gotten your tickets yet? If not, what are you waiting for?